With vibrant red hair, classic beauty, and an infectious laugh, Julia Roberts went from an ordinary actress to “America’s Sweetheart” seemingly overnight in the 90’s. Her extremely likable roles in a slew of endearing romantic comedies allowed this leading lady to become nothing short of a Hollywood legend. Despite her fame and fortune, Julia and her husband Danny Moder have a notoriously low-key romance and prefer to keep their love story out of the spotlight. Learn more about Julia Roberts’ engagement ring and find similar sophisticated pieces from the Victor Barboné collection! 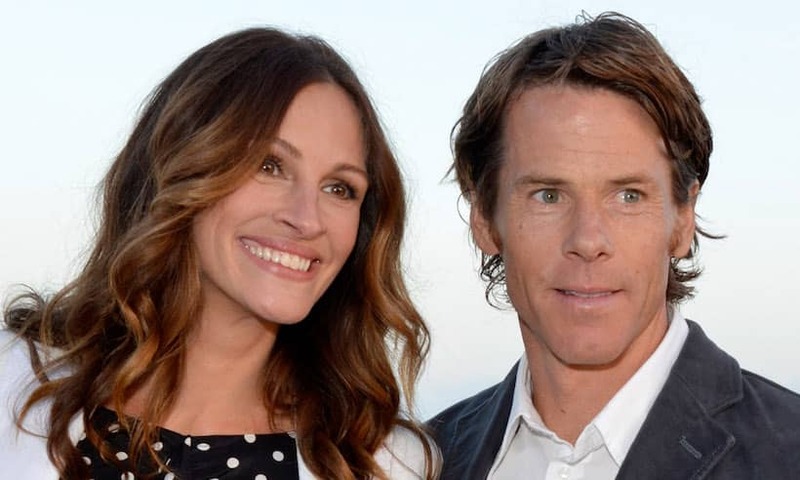 Julia Roberts and Danny Moder met in the year 2000 on the set of “The Mexican.” She was an actress in the film, and he was a cinematographer. Despite Moder being married at the time, he and the Oscar-winning actress formed a strong bond that some say led to the official end of his marriage later that year. Even in the early stages of their romance, the couple tended to stay out of the public eye. Rather than frequenting places in New York or LA where they could be easily photographed or spotted by fans, the couple preferred to spend their time at Julia’s sprawling ranch outside of Los Angeles, which she purchased in 1995 for over 5-million dollars. Hollywood power couples are known for shamelessly showing off gigantic and over-the-top engagement rings. Yet, even though Julia Roberts has been among the highest paid actresses, she is an exception to this rule. Her surprisingly simple and sophisticated engagement ring features a small emerald cut gemstone and was reportedly purchased by Moder for less than $4,000 at a shopping mall. These two prove that the size of a ring has no correlation to how in love a couple is! The couple gathered 60 family members and friends for a 4th of July bash in 2002 at Julia’s beloved ranch in the mountains. Late at night on July 3rd, they pleasantly surprised everyone in attendance with an impromptu wedding ceremony and reception. The wedding was just as laid-back as the couple themselves and lacked many of the elements present at a large, traditional affair. Instead, they had a simple 20-minute ceremony under the stars. The bride wore a pink cotton dress and they exchanged sweet, handwritten vows in front of their closest family and friends before dancing the night away. Staying private has worked wonders for the couple, who have remained happily married for nearly 16 years. They have three children and reside in Malibu, where friends and family say they are incredibly happy and more in love than ever!